Within every organization there may exist a task, or range of tasks, outside of the company’s core competencies. When it is impractical to install a permanent structural or human resources solution we may rely on outside, “third party” vendors. We need to consider the compliance-related risks associated with using third-party service providers. 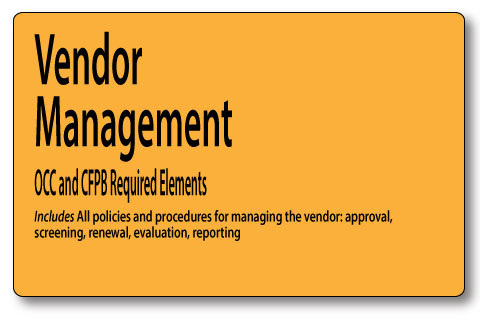 ​The CFPB and OCC both recently issued guidance highlighting business' responsibilities for the actions of their vendors. This process allows you to screen, approve, monitor and renew approvals for all of the vendors common to the mortgage industry.